The focus of the LMP is to rehabilitate and restore the river’s ecological functioning, clean the riparian edge, manage and control alien invasive species whilst replanting with indigenous vegetation and enhancing the recreational and social value of the river and its trail. In light of this, the project continues to be a success as it constantly expands the scope of its work and thereby improves the overall health of the aquatic systems. The management of the LMP, as well as the public interface, is undertaken by Project Manager, Conor Eastment, whilst the team continues to be supervised by the highly capable Mncekeleli Klaas. ABAX’s generous contributions continue to support the wages of the project manager, team supervisor and four of the remaining seven team members. Over the past year, the LMP has built on previous successes as well as fostered existing relationships in furtherance of the pursuit of a healthier riverine environment. The LMP team’s constant presence on the river has become familiar with many river users as we continue to expand the reach and efficacy of the Project. We continue to encourage and foster a participative ethic with river users, as evidenced by the success of our social media platforms. The focus of the LMP team in 2016 has mainly been in the middle and lower reaches of the river, with the predominant focus being on rehabilitation and engagement with previously uninvolved partners along the river. In March this year the LMP were intimately involved in the rehabilitation of a previously infested stretch of the riparian corridor within the Boschenheuwel Arboretum. Following alien invasive clearing work conducted late in 2015, the LMP were tasked with follow-up control efforts of alien regrowth, as well assisting in the replanting of indigenous riverine vegetation in the area. Following the felling of numerous large, invasive trees, the riparian corridor has been successfully opened-up and maintained, preventing the spread of damaging alien seeds downstream as well as enhancing the public’s enjoyment and utilisation of the space. These efforts were in collaboration with the City of Cape Town’s Invasive Species Unit (ISU), with whom the Project have interacted on a far more regular basis. By dove-tailing the work of the LMP and ISU, far greater effectiveness has been achieved in both group’s work. Without the LMP, the ISU simply would not have the capacity to give the Liesbeek the attention it requires in order to maintain and improve its current state. Local knowledge of the entire river has been provided by the LMP Project Manager which has fed into the Alien Invasive Species Catchment Management Plan currently being prepared by the ISU. Rehabilitated section of Boschenheuwel Arboretum. Following previous year’s efforts in clearing invasive species, replanting indigenous vegetation and general improvement of facilities along the trail, the LMP has mainly focused on maintaining the state of the riparian edge. Without the work performed by the LMP, this highly utilised section of the river trail would soon fall into its previous state of disrepair- as such it is imperative that time is devoted by the LMP to its upkeep. A significant achievement by the LMP was the negotiation and reclamation of a stretch of land within the Paradise Park. A large alien invasive hedge of Lantana camara which had fallen on disputed land between public open space and private property was removed, reclaimed and rehabilitated. By engaging with the landowner, the LMP were able to convince the owner to allow the LMP to remove the hedge and subsequently shift his boundary fence back 5 metres- introducing a new flower bed into the park which was replanted with various succulents as well as a few afromontane indigenous trees. By far the most significant success of the LMP over the past year has been the rehabilitation of a series of bioretention ponds nestled between the River Park complex, Liesbeek Parkway and the N2. These retention ponds, constructed in 1997 had fallen into a state of utter disrepair due to siltation, a lack of maintenance and the invasion of homeless individuals. So undesirable and overgrown was the section of the trail that it was barely used by members of the public as it posed significant security risks. Furthermore, water quality analysis of the stagnant remnants of water within the ponds revealed a highly polluted environment in terms of heavy metal counts, lack of oxygen and other variables associated with water quality. Years of attempts to engage with the River Park and City of Cape Town officials and councillors had proved fruitless and as such the LMP took it upon itself to remedy the situation. Firstly, the infestation of Typha capenisis was dealt with by manual means, clearing a large amount of biomass from the ponds, other problematic plant species, including listed invasives were subsequently removed in February. In order to rehabilitate the system though, restored flow was required. By digging a trench between the first and second ponds, silt that had impeded the flow of water was removed and for the first time in 15 years, water entered and exited the ponds from and to the Liesbeek. Almost immediately water quality improved as the polluted water was flushed and fresh river water permeated the ponds. Much time has been devoted to the ponds this year and previously degraded sections have been entirely replanted with indigenous vegetation, including but not limited to 20 indigenous trees. The results of the work have been clear for all to see. From a biological perspective, a variety of bird species have inhabited the ponds with many of them breeding. This spring alone has seen the successful rearing of African Black Duck, Yellow Billed Duck, Moorhen and Cape Weaver chicks. Aquatic invertebrate and vertebrate species have also returned to the ponds marking a clear improvement of health and a significant increase in habitat for all of the above mentioned species and more. In addition to the success in terms of functional ecology, the social enjoyment of the trail has been enhanced with a clear increase in walkers, runners and cyclists now enjoying the stretch without concern for their own security. More work is required and ongoing at these retention ponds with the intention being that they act as a ‘bioretention facility’, thus cleaning the river and storm-water entering the system. 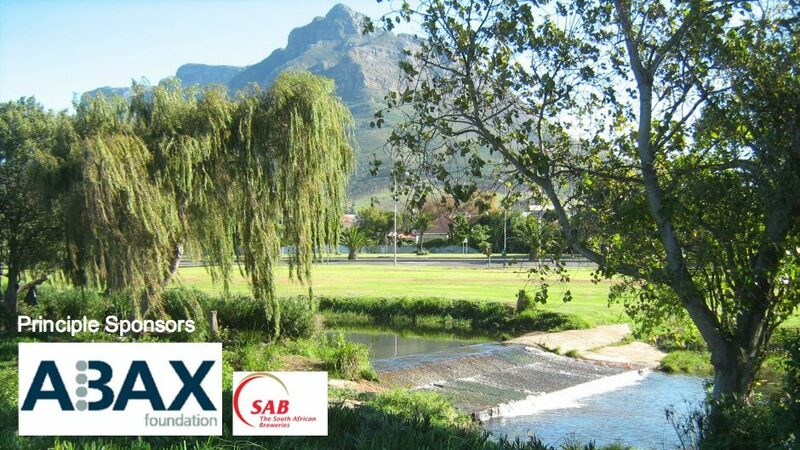 As the only retention ponds along the Liesbeek, it is viewed as a critical case study for what can be achieved along the river in its entirety. Currently the LMP is using the ponds to propagate Palmiet reeds which will have uses along the whole river in both their potential in cleaning water as well as preventing erosion. Following the good work of the LMP, the Two Rivers Urban Park stretch of riparian habitat has been maintained to add aesthetically and ecologically to the park and its surrounds. The most significant achievement in this area of the river has been the ongoing control efforts of the wetland invader, Lythrum salicira. This Turkish species of plant has completely decimated river systems all over the globe and currently the only place it is found in the entire country is within the Liesbeek corridor. The LMP is solely tasked by SANBI to control and eradicate this species and over the past year the population of the Lythrum has seen a sharp decline. Whilst it is too early to declare a population crash, early indicators suggest that this may be occurring. The LMP are the only service providers in the country with experience in dealing with this species and as such the Project’s efforts are crucial in its control. Whilst the LMP continues to witness great success in its endeavours, there are many ongoing issues and challenges that the Project faces. The greater social problem of the homeless is an enduring issue with the majority of the Project’s cleaning operations caused by both the material and human waste contributed by these individuals. Only with greater social engagement from the City of Cape Town can these problems be alleviated however until such a time the LMP is critical in mitigating the effects of these individuals. Furthermore, as the LMP continues in its work in rehabilitating the riparian habitat, so too does the need for greater capacity increase in order to maintain past successes. Constant expansion of the team’s capacity is critical to the Project’s success whilst the river is still being reclaimed and it is hoped that in the near future that FOL shall be able to fund a second maintenance team along the river. The LMP team has grown over the past year and represents diversity in its make-up. Currently the team includes eight members, including three females and all classified as youth and from previous disadvantaged communities. Through their involvement with the LMP, they are gaining the skills and experience necessary to further their careers and improve their own personal circumstances. For instance, through the LMP one team member has recently obtained his driver’s license and saved enough money to buy his own car- a significant personal achievement. Through the work of the Education Officer, Andrew Bennet, the entire LMP team are enrolled in a NQF level 2 Environmental Practices course which will provide the team with significantly better career prospects- allowing them to move on from the project and new individuals to join the team and likewise improve their own personal circumstances and plight.